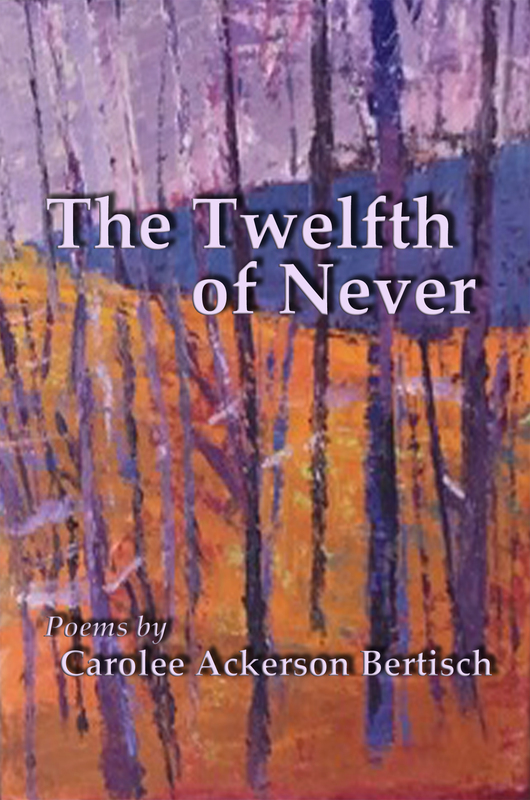 Carolee Bertisch is a long published author who has just published a new volume of poems and paintings – The Twelfth of Never. She was Writing Coordinator for the Rye Neck School District in New York, and now lives in Ponte Vedra Beach, Florida. There she leads two book discussion groups and participates in A Gathering of Poets. The latter group gathers at the Ponte Vedra Beach library to critique poems. It also performs Poet Theaters for local arts groups. She’s also poetry chair for the Florida Heritage Book Festival. There she organizes poetry sessions including speakers on and teachers of poetry. She organized a poetry contest for high school students. Carolee was also one of the people who worked hard to organize the area now known as Bird Island Park. It surrounds the public library in Ponte Vedra Beach. It’s a passive park that offers opportunities for small gatherings of people, but it’s on a flyway, so it offers even more opportunities for birds as a sanctuary. Carolee shares her unique observations of modern life in The Twelfth of Never and her heartbreak over the death of her husband. Included are some of her interesting paintings. The Kindle version features the paintings in color. You can buy it through this link.